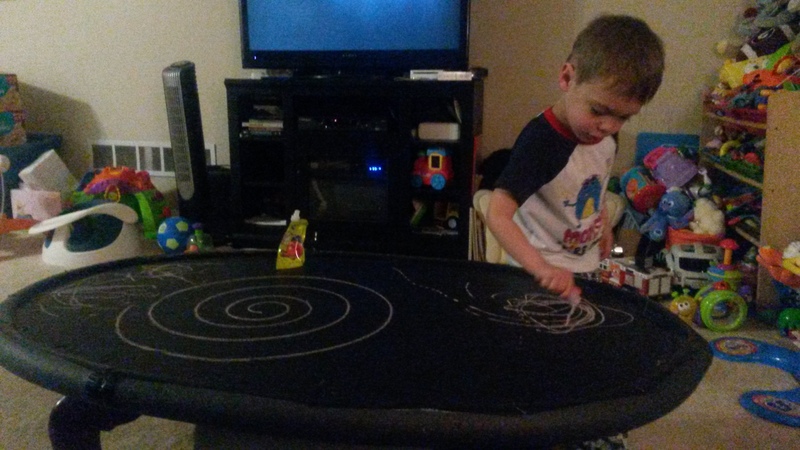 I’ve been sitting around for the past couple of days when I have a spare minute, watching my son playing with his new chalkboard table. Just a sidenote: if you have kids, and the kids are in any way artistically inclined, you owe it to yourself to make one of these. Just take any old crappy coffee table, go to Home Depot and buy a $15 can of chalkboard paint, lay down a couple of coats on top of the table, and let it dry overnight. Easiest and most rewarding DIY project I’ve ever undertaken. Anyway, my boy has a dubious approach to the thing. He loves coloring but lacks any kind of… I don’t want to say the motor control, because he seems to be doing what he wants to do… what I’m trying to say is, the things he draws aren’t shapes I recognize from this universe. Everything looks like a sea urchin, or a squiggle, or maybe just one long shapeless line. He will draw these designs, over and over again, one on top of another, until the table literally looks like a bucket of chalk vomited all over it, then he will gleefully take a rag, wipe the table clean, and start anew. Which is, in itself, adorable and delightful; hours of fun just asking the boy what he’s drawn and trying to imagine how exactly he sees these things. But it goes a level deeper. Because sometimes, he’ll decide to draw something himself. “I going to draw a car.” Okay, sprout, go ahead. *scribble, scribble. * He works with such intensity sometimes that I find myself looking over his shoulder to see exactly how he’s going to describe the shape of a car. Of course he isn’t. It’s just a shapeless blob of color. But he will finish, stand back to admire his work, and say, “Oh, that’s not a car, that’s a banana.” And then go on drawing something else. It’s a nifty little parlor trick, I guess, for a three-year-old to be able to do, but I started thinking about the boy, and I started thinking about creativity and art in general, as is my wont, and then came the lightning strike moment. The moment where the mundane, not-at-all special and completely-by-accident whimsical actions of a toddler shake my preconceived notions of the world to the very roots. How many times have I found myself banging my head against a moment in a story? A character who just doesn’t seem to behave the way I want him to? Or a fiddly bit of plot that just won’t jive with the pieces all around it? Or an element that I need for the story to move forward, but I can’t figure out how to work it into the story? Or, maybe, the problem is more intrinsic to the story: I’m trying to write a science fiction thriller but it detours into comedy, or I’m trying to write a lighthearted romantic-comedic bit, but suddenly things feel all melodramatic? I always talk about how stories have lives of their own, how the characters have drives and desires buried within them that are sometimes a surprise even to me, but I still find myself trying to force square pegs into round holes. No, the story is meant to be this way. No, I need to focus on this aspect of the plot now. No, I’m trying to send this thematic message. But not my son. The art takes him in a new direction, he’s happy — even ecstatic — to detour and abandon the thing he thought he was working on. The story changes, he changes with it. He has no preconceived notions of what it should be, there is no consideration for creating the wrong thing. The thing he creates is fine by him, whether it’s what he set out to create or not. And I think that’s pretty freakin’ awesome. Because when you don’t get hung up on the problems in your story, when you don’t wander off into the bog of unrealized expectations, you can process the project in front of you with the unbiased perception of… well, of a child. To a kid, things are what they are. And there’s nothing wrong with that. This entry was posted on Wednesday, May 20th, 2015 at 2:55 PM	and tagged with art, funny, inspiration, motivation, parenting, toddler life, toddlers are awesome, writer's block, Writing and posted in Kids, Ramble. You can follow any responses to this entry through the RSS 2.0 feed.